There are several ways to start Unit Cell, a tool in the Higher-Order Structure category. After a PDB or mmCIF file has been opened in Chimera, Unit Cell can generate symmetry-related copies if the file contains sufficient information. In the dialog, Molecule can be set to any open molecule model. The space group, unit cell parameters, and numbers of transformation matrices for the current Molecule are shown, if available. Make copies loads copies of the coordinates from the same source as the originally opened model (a local file or a file fetched from the Web) and transforms them as specified by the options. Outline toggles whether a white outline of the unit cell is shown. Delete copies removes all copies of the molecule except the original. The copies can be saved. Close simply dismisses the dialog, while Help opens this page in a browser window. 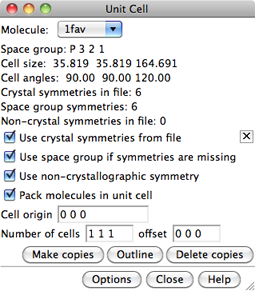 Use space group if symmetries are missing - for files without crystallographic symmetry matrices, use the space group name in the CRYST1 record of a PDB file to look up the crystallographic symmetry. Space group names are the full Hermann-Mauguin symbols, e.g., P 1 21 1 rather than P 21 (see column xHM_SpgrpSymbol in the CCP4 summary listing). Use non-crystallographic symmetry - apply noncrystallographic symmetry described by MTRIX1, MTRIX2, and MTRIX3 matrices in a PDB file. Only a small fraction of PDB entries have MTRIX records (~10% in 2003). Most of these describe how to transform the coordinates of one chain to match closely the coordinates of another chain already present in the PDB file. In a few cases (~0.25% of PDB entries), the MTRIX records describe a transformation that produces a new copy whose coordinates are not already in the file. These two cases are distinguished by the contents of column 60 in the MTRIX records. A "1" means that the transformation yields coordinates that are already given (these MTRIX records are ignored by Unit Cell), whereas a blank space means that the transformation will produce a new copy. MTRIX column 60 may be set incorrectly in some files. Further, MTRIX records are sometimes missing. For example, 1cd3 has no MTRIX records, but the remarks describe how to produce them from the BIOMT records. Of course, this cannot be handled by Unit Cell. MTRIX records do not describe crystallographic symmetries, but additional symmetries of the asymmetric unit of the crystal. Because the copies of the molecule occupy nonequivalent positions in the crystal, they usually have small structural differences due to differing crystal contacts. Thus, an independent set of coordinates is usually included for these copies, and MTRIX records are not needed. MTRIX records are often used for icosahedral virus particles, where the PDB file will include the coordinates of one molecule in the shell and MTRIX records describing how to place copies that are not crystallographically equivalent. The size of the virus particle precludes independent refinement of coordinates for each copy of a molecule in the shell. Cell origin coordinates (default 0 0 0) are in unit cell lengths and describe translations of the unit cell along its axes. Values of a coordinate that differ by integer amounts are equivalent; e.g., (0.3 0 0) is equivalent to (-0.7 0 0) and (4.3 0 0). Changing the origin may rearrange the copies and shift the outline (if present). The shift will occur in the direction that maintains the center of the original copy within the box. Number of cells (default 1 1 1, a single cell) offset (default 0 0 0) allows generating a block of multiple unit cells. The first three values specify dimensions in number of cells along the unit cell axes; the second three values specify the placement of the block relative to the cell containing the original structure. For example, number of cells 3 1 1 and offset –1 0 0 would give a 3x1x1 block of cells with the original structure in the middle cell along the first axis. Changes in cell origin or number can be applied by pressing Enter (return) or clicking the Make copies button. Many problems are due to information that is missing from (or incorrect within) the input file. One way to validate symmetry information is to identify steric clashes with the Crystal Contacts tool. Unit Cell does not generate multimers defined by BIOMT matrices, but this can be done with Multiscale Models or the command sym.